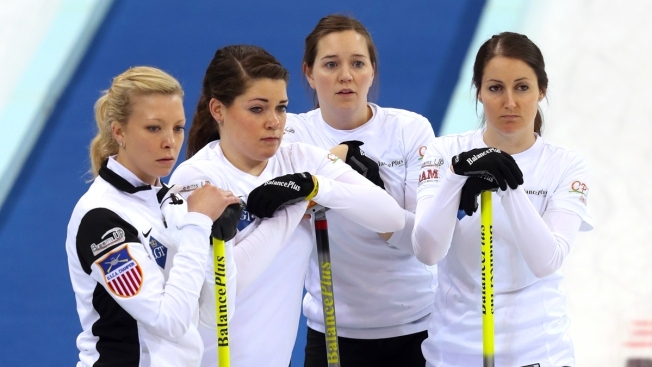 Members of the United States team, from left, Nina Roth, Becca Hamilton, Aileen Geving, and Tabitha Peterson watch the action during their match against Switzerland in the CPT World Women's Curling Championship in Beijing, Thursday, March 23, 2017. Registered nurse Nina Roth led her team to victory in the U.S. curling trials on Saturday to earn the American women's spot in the Olympics. Fellow first-time Olympians Tabitha Peterson, Aileen Geving and Becca Hamilton are set to join her at the Winter Games in Pyeongchang. Roth's rink beat the one led by Jamie Sinclair 7-6 to win the best-of-three playoff in Omaha. Roth's team missed back-to-back takeouts in the second-to-last end, then nearly gave the match away when Roth was called for a foul for failing to release her stone before it crossed the hogline. In preparation for the Olympic Winter Games, NBC gave Team USA some of the most popular Korean snacks to see what they thought of them. But Roth's team scored two in the 10th end, or inning, to earn the victory. Roth, Peterson and Hamilton also have qualified for next month's mixed doubles trials.